Executed in 1994. This work is from a series of twenty-four, each uniquely colored. B. Bürgi, Rudolf Stingel, exh. cat., Kunstalle Zurich, 1995, pp. 13, 15 (another variant illustrated). New York, Paula Cooper Gallery, Rudolf Stingel, October-November 1994 (another variant exhibited). Chicago, Museum of Contemporary Art and New York, Whitney Museum of Exhibited American Art, Rudolf Stingel, January-October 2007 (another variant exhibited). Rudolf Stingel is best known for his repositioning of painting not only through a shift in its internal structure, but by its redefinition within, and more rarely as something integrated into an architectural space. And yet, one of the most iconic works in Stingel's oeuvre is his Buddha, Untitled, 1994. In order to bring together his past, his practice and the beau monde Buddhist fashion of the Western world, he created an iconoclastic amalgamation of a meditative Buddha and the many armed Hindu deity Vishnu - therewith creating his own personal Stingel deity. 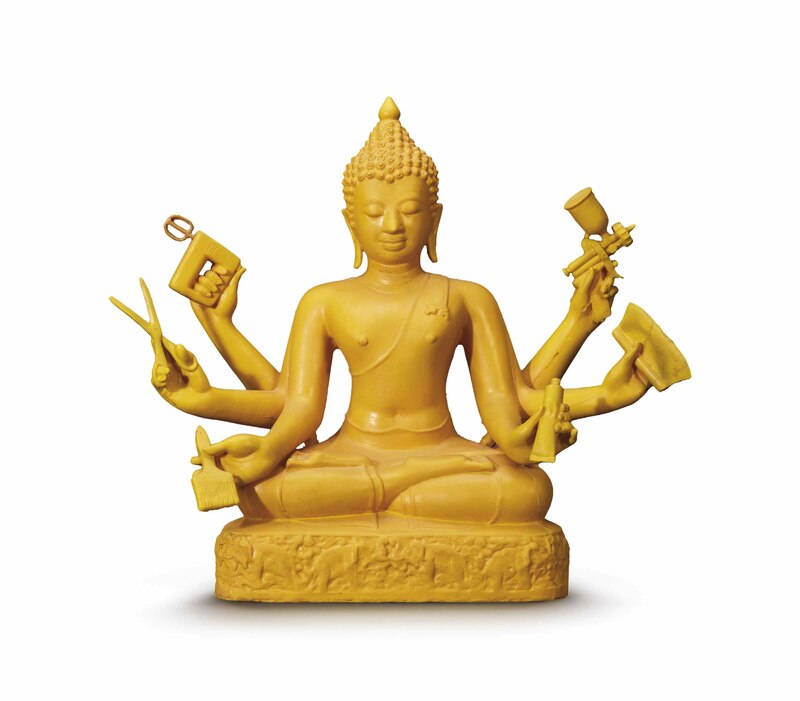 Cast in rubber and made in 24 candy-bright colours, each of the Buddha's six arms holds a tool from Stingel's Untitled (Instructions), 1998. The latter is a how-to manual in which he details the step-by-step process required to create one of his early abstract paintings: a tube of paint, an electric hand-mixer, a pair of scissors, a paintbrush and a set of instructions are wavered around the body and head of the celestial pop-culture icon. Stingel's associations with Buddha are longstanding. His father, who traveled frequently to India, would bring back small Buddha figurines from the Asian continent, with which as a boy he would play. Over a decade later, in the 1970s, it seemed to become mandatory to engage with the religion and what was understood of its practices - namely meditative reflection in front of a shrine. "You had to do it if you wanted to be cool," he said. "But we all faked it. It was all a lie - no one ever really meditated. (...) It seemed like an accessory you had to have to be part of an intellectual elite, I don't think it has anything to do with religion. It's pure decoration. It's a taste, a lifestyle." (Stingel in interview with David Coleman, reproduced in "Not a Believer but Just in Case Om", in The New York Times, July 2007). And therewith, the Buddha stands: as a testimony to modern man's search for spirituality in a world of consumerist pleasures, where art has become so removed from the artist's exclusive touch that how-to manuals substitute the actual product. It is an ironic self-referential sculpture commentating on modern society and one of its twentieth century whims. And yet, the biggest irony of them all must be Stingel's relationship with the heavy bronze Buddha he purchased as a model for his deity: it proves to be irksomely persistent. Thirteen years later, the statue is still sitting in his East Village apartment. "I am actually embarrassed to have a Buddha. (...) (But) I can't get rid of it. I have that Italian superstitious thing. I'm afraid that things will all go bad if I give it away. I'm damned to live with the thing for the rest of my life. I can't even put him away. If I put it in a dark corner, I think, 'No, he's going to get angry.' So he's always around" (ibid.). And so, while the actual Untitled, 1994, sculpture circulates amongst the hands of collectors, galleries and museums, its forefather - one of a million in Manhattan alone - remains on Stingel's coffee table, submersed around an ocean of books.